AOM Families - In order to redeem your voucher or buy a family bundle you must call the BCC (918) 337-2787 or visit in person. Art of Motion Dance Celebrates 32 years of Teaching Bartlesville’s youth. 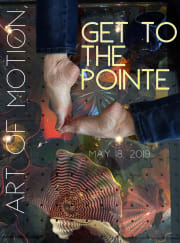 “Get to the Pointe!” Is family friendly entertainment featuring students from Preschool through graduating Seniors. Ballet, Tap, Jazz and everything in between will grace the stage as Art of Motion Dance concludes another season of dance.